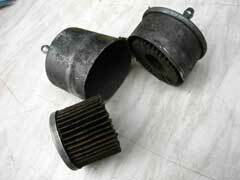 Each and every automobile has a fuel filter. The fuel filter keeps dirt, oil and particles out of the fuel line to avoid it becoming clogged. On occasion, however, the fuel filter does become clogged. Clogged fuel filter symptoms are easy to spot and to replace, once the clogged fuel filter symptom is alleviated. Certain fuel filters, such as ones in the Fass fuel system, contain a water sensor to signal when there are potential issues arising in the fuel line. automotive fuel filters need to be watched and maintained because of the ease of debris that can get into the filter. Here are some clogged fuel filter symptoms. 1. Problems starting the vehicle – this can be a sign that the fuel filter is clogged. 2. Acceleration issues – the vehicle will not speed up despite pushing and mashing the accelerator. 3. Engine Performance – clanking and grinding can be a sign that the engine is not adequately performing due to a clogged fuel filter. 4. Fumes – odor from your vehicle is often a clogged fuel filter symptom. 5. Misfiring – engine sound has changed. Every engine has a unique sound and if yours is sounding different than it usually does, a cleaning of the fuel filter is necessary. 6. Engine stopping – sometimes the engine will cut off completely, in spite of the fact that there is plenty of gas in the vehicle. Since your engine is one of the most delicate parts of your automobile, it is recommended to take your car to an auto shop to treat your clogged fuel filter symptoms if your budget can afford it; but it can be done by you also. Certain vehicles, depending upon their size require fuel transfer pumps that aid in ensuring clean fuel is put back into the vehicle once the filter is changed. Fuel filter replacement typically costs around $20 and takes a few minutes to change. Automotive masters suggest changing your fuel filter every year to keep your fuel line free and clear of fragments that can cause potential damage down the road.